You will print roll sheets prior to each meeting, after the previous meeting’s attendance and guests have been entered. We include recent guests on the roll sheets, so we advise you to print these each week and not any farther in advance. There are several ways to create roll sheets. Organizations need a schedule in order for you to print roll sheets from the Organization > Search page. For ad hoc meetings, you can print a roll sheet from the organization. All roll sheets have bar codes for each individual as well as a bar code for the meeting. On the dialog box you will have the option to Use Word . If you check this box the roll sheets will use Word or whatever word processor you have on your computer instead of the PDF version. If you do not have Word or a word processor that is compatible always use the default PDF version. If you are using Alternative Names with Chinese characters you should always check Use Word in the dialog box. The PDF version will not display the Chinese characters. Go to Organizations > Search / Manage , select the Program , Division and Schedule , and click Search . Select the Blue Toolbar > Cloud > Reports > Rollsheet(s) . 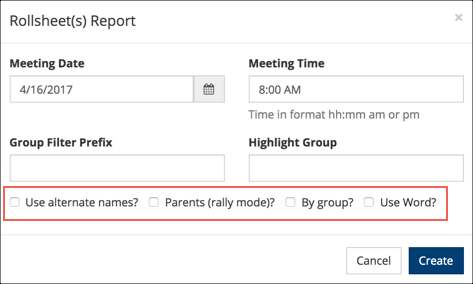 Select the Date and verify the Meeting Time, and click Create . The roll sheets will open in a PDF file. Print from the PDF Toolbar. Exception: If you check Use Word the roll sheets will open in Word and you will print from Word. See above section regarding using Word. You can also select just a Program without a Division. However, if you do not select a Schedule, the date/time will default to the current date 8:00 AM. Go to the organization and select Blue Toolbar > Cloud > Org Members Reports > Rollsheet . If the organization has multiple Schedules, Choose a Schedule for that Meeting, verify the Meeting Date and Time, and make changes if needed. Then click OK . The roll sheet will open in a PDF file. Print from the PDF Toolbar. Use this option if you want a separate roll sheet for each sub-group in the organization. If the organization has multiple Schedules, Choose a Schedule for that Meeting, verify the Meeting Date and Time, and make changes if needed. After verifying the date/time, check the box By Group . This will generate a roll sheet for every sub-group with the name of the organization and the sub-group name in the header and will sort by the name of the sub-group.. If you want to print roll sheets by certain sub-groups (and not all sub-groups), enter the prefix for the group you want included in the Group Filter Prefix field. Example: The choir has sub-groups for voice parts (V:Alto; V:Tenor; etc). The choir also has sub-groups for care groups (CG:Smith; CG:Jones; etc). To print roll sheets by the voice part sub-groups, enter V: in the sub-group prefix field. Click OK and print as above. This works for any one specific sub-group. If the member is in the group listed as the Highlight Group, that group name will print on the roll sheet under that member’s name. Our Wed. night children’s choirs asked the question (in the online registration) “Can this child leave without a parent?” If they answered Yes, they were automatically placed in the sub-group named “FreeToLeave”. Using the method below, you can have this group name print on the roll sheet under the child’s name. Follow directions as above, printing either for an individual organization or for an entire Program/Division/Schedule. Enter the Sub-Group Name you wish to print on the roll sheet in the Highlight Group text field. Print as usual. Do not create sub-groups with any spaces in the name. You can print special types of roll sheets that will include the parents. When you swipe the bar code for a parent, they will be marked present in their own class, even though they are attending a rally with their children. For this type of roll sheet, scanning (using a wand scanner) is the best method for recording attendance. Will guests print on the roll sheets? Yes. The guests will print at the end of the alpha list of members on the roll sheet and will be in bold type. This is one reason why you do not want to print roll sheets for more than one meeting at a time. How long will visitors continue to print on the roll sheets after they visit? This is based on the Roll Sheet Guest Weeks setting in the organization. To set this, go to the Settings > Attendance tab on the organization, and in the field labeled Roll Sheet Guest Weeks , enter a whole number for the number of weeks for a person’s name to print after their last visit to that class. Most classes are set at 4, 5 or 6. If I will be scanning attendance, do the boxes need to be filled in completely when the attendance is marked? No. You will actually scan the bar code, not the box. Can the name of a sub-group in an organization display on the roll sheet by the name of the person? Can the Alt Name display on the roll sheet? Yes. Just check the box beside Use Alt Name and check the box Use Word . See section above. What else prints on the roll sheet besides the name and bar code? Each person will have letter(s) in parentheses beside the name. VM = Visiting Member from another org. See above questions re sub-group name and Alt Name. When I print from Firefox, the roll sheets do not print landscape and they don’t look right. How can I fix this? Firefox is probably opening the PDF in their own viewer. You can check Use Word and avoid their version of the PDF viewer or you can follow the instructions in the article below to use the PDF version.